Preface: UV gel manicure products should only be applied to healthy nail plates, and are best avoided if nail plates are overly thin, weak or damaged. Clients who desire frequent colour changes ( every few days) should be encouraged to use traditional types of nail polish rather than receiving UV gel manicure services. UV gel manicures are used to cosmetically beautify natural nails. These safe and useful salon services require proper application, maintenance and periodic removal, followed by reapplication of the nail coating. 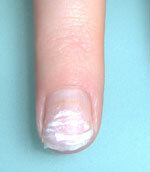 During the removal process, the goal of every nail technician should be to exercise great care and avoid techniques which may damage the natural nail. The purpose of this communication is to convey additional information that can help nail technicians minimize the potential for certain types of nail damage possibly associated with improper removal. Clients expect that wearing UV gel manicure coatings will not damage their natural nails, therefore proper and careful removal is necessary to meet this expectation to ensure clients will continue to seek out these beneficial nail salon services. To properly remove, UV gel manicure nail coating are soaked in remover solvents that are typically acetone or blends of acetone and solvents or additives. Acetone is used because it is fast-acting and has a long history of safe use for this type of application. The nail technician’s goal in removing UV gel manicure nail coating should be to allow the remover solvents to gently break the adhesive bonds that adhere the coating to the nail’s surface without causing any significant damage the natural nail. To achieve this goal, it is important to always avoid exerting force to remove the coating. If the nail coating has not soaked in the recommended removal solvent for a sufficient period, it will be more difficult to remove. Also, if the coating remains on the nail plate for a longer than the manufacturer’s recommended time, it will become increasingly more difficult to remove because as the coating ages it becomes more resistant to solvents. Forceful scraping or prying techniques even with a wooden pusher, can dislodge many layers of nail cells to leave large numbers of tiny pits on the natural nail’s surface which collectively can give the the appearance of surface “white spots” of varying size and shapes. Clients incorrectly assume that the UV gel manicure coating has damaged their nails and don’t realize this type of damage is related to improper application, maintenance and/or removal. Soaking the natural nail for even a few minutes in any solvent, e.g. acetone or water will temporarily soften the nail plate surface, making it more susceptible to damage from any type of implement used to pry, push or force these coating from the nail plate. Manufacturers provide removal instructions indicating how long a particular UV gel manicure coating should be soaked for proper removal, but such recommendations are the “minimum” soak time, not the “maximum” as is mistakenly interpreted by some nail technicians. There coatings often require additional soaking time to safely remove. Various factors affect removal time, e.g. thickness, composition and degree of cure. UV gel manicure coatings are more easily removed after a fresh application and become increasingly more difficult to remove as they continue age. It is very important to note that failure to exactly follow manufacturer’s application instructions and curing procedure an make later removal more difficult. Recommended procedures for removal must also be heeded and precisely followed. For example, some manufacturers recommended using solvents containing, absorbent nail wraps designed to target the remover solvent for enhanced removal speed. If these instructions are ignored or deviated from, nail plate damage may become more likely. Since many factors increase a nail coating’s resistance to solvent removers, nail professionals should lengthen (increase) solvent remover soaking times as needed to facilitate gentle, non-damaging coating removal from the natural nail. Clients should not experience any discomfort during removal. The potential for nail plate damage resulting from prying, pushing or filing the nail coating (or pieces of residual coating) from the nail plate may be greatly reduced or completely eliminated by increasing the manufacturers’ recommended removal solvent, causing the coating to swell and lose adhesion to the nail plate. Unless specifically instructed to do so by the manufacturer, nail technicians should NOT use an abrasive file to reduce the top layer of the UV manicure coating. A few manufacturers make this recommendation to allow the removal solvent to act more quickly and efficient to soften and break apart the coating. If this technique is used, nail technicians MUST use caution to never file trough the bottom layer of the coating into the natural nail plate to avoid creating nail plate damage e.g. excessive thinning, which can weaken the nail plate, making it more susceptible to cracking or breaking. Never use an abrasive to completely remove any nail coating! Electric and manual abrasive files have the potential to cause over thinning of the nail plate when used in this fashion and should not be used to remove any UV gel manicure nail coating. Any form of overly aggressive filing must be avoided since this is likely to damage the underlying nail bed and lead to conditions such as onycholysis or splinter hemorrhages. Clients can also cause these same types of issues by picking or prying coatings from their own nails. Warn clients NOT to attempt to pick, pry or otherwise forcibly remove lifted areas of the nail coating or they may risk damaging the surface of the nail plate. Nail professionals should always be on the lookout for any signs of nail damage related to UV gel manicure removal and take appropriate steps to eliminate their causes, e.g. surface white spots or roughened areas or nail plates that are sufficiently softened, continue softening in the recommended removal solvent until it may be gently removed without causing any damage to the nail plate. In short, don’t rush the removal process! This is an important procedure, so take the necessary time needed to completely soften UV gel manicure coating before gently removing with cautious approach and careful technique. Your clients will appreciate the extra care and attention, while their nails will enjoy the benefits of wearing UV gels manicures.